Extensive research report on global train seat materials market by Persistence Market Research includes in-depth analysis and assessment of the global market and presents key insights on virus market segments that supports the reader in chalking key decisions and strategies to gain advantage over the competition in the global market. This research report covers future market projections or forecasts for a period of nine years, starting from 2017 till 2026. Forecasts along with acute scrutiny on changing market dynamics across key regions in the globe has been included in this research report. Accuracy of the data and statistics depends on the process carried out for researching purpose. Weighted assessment of the global market for train seat materials is underpinned by a comprehensive analytical research methodology that includes extensive secondary and primary research. Secondary research is carried out to gain overall market understanding and simultaneously primary research process is initiated to deep dive in the market. The gathered data from secondary research is analyzed, re-evaluated and collaborated during each step of primary research. This enhances the accuracy of the research and the data so gathered. This process is carried out for each market segment to obtain a near 100 percent accurate analysis. The data gathered from key sources, secondary research and primary research are triangulated thus achieving an accurate global market representation. Global train seat materials market research report focuses on key opportunities, drivers, trends, macroeconomic aspects, socioeconomic factors and challenges that have an impact on the growth of the global market. Analysis of these aspects of the market along with scrutiny of their changing magnitudes and intensities across key regions in the globe has been carried out. This reflects a global market perspective that the reader can use to gain insights pertaining to growth potential of the market in a particular region during the nine year period. In addition, research study reflects an unbiased market assessment for train seat materials. The research study on global train seat materials market portrays a complete intelligence package that includes analysis on key players operating in the train seat materials market. New product innovations brought in by key players, new developments, company overview, key strategies, financials such as market share, sales revenues and production capacities, geographical spread and mergers and acquisitions done by key players has been included in this section of the report. Moreover, the SWOT analysis of key players provided in the research report can give a heads up to upcoming players and businesses to plan effective moves to start grabbing hold over regional markets. Growth strategies and informed decisions are essential for any business to prosper. They can be assessed and formulated with assistance of competitive scenario covered in this section. The demand for rail transport is currently witnessing steady rise across regions. Personal income can be a major aspect defining the demand for rail travel, indirectly impacting the railway industry growth. Railway industry has also witnessed various developments with respect to train modifications and ticketing developments to name a few. Moreover, with higher investments in research and development, emergence of high speed trains and hyper speed trains is gaining high traction. For instance, recent innovations include the use of hyper-loops that cover large distances within minutes making it easy for business professionals by reducing their traveling time. This has indirectly influenced the manufacturers of railways to incorporate effective seating for their customers. Cushioning is a major aspect that drives the demand for railways, as people prefer convenience over cost. This has a major influence on the use of various materials used for train seats. Persistence Market Research has analyzed the future of train seat materials and devised an analytical research report on global train seats materials market wherein it has included the growth trajectory of the market. As per analysis, the global market for train seat materials is estimated to touch a valuation of US$ 200 Mn by end of 2024 and is projected to expand at a steady rate during the forecast period, 2017-2024. Manufacturers involved in train seat materials market are focusing on introducing advanced materials and brining airline luxury in train seats so as to assist train operators in attracting flight passengers to railway transportation. Moreover, increasing focus of manufacturers on product development for providing seat materials that meet fire safety regulations has also been observed. 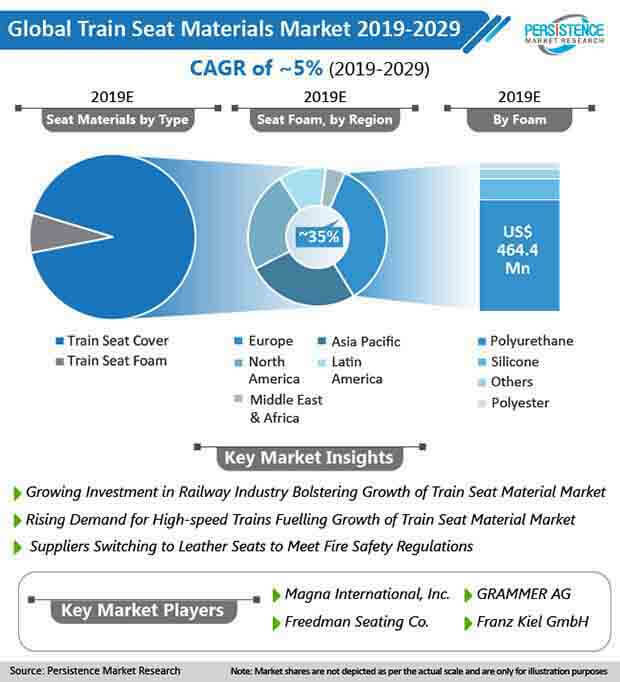 Key players involved in the global train seat materials market include Magna International, Inc., GRAMMER AG, Freedman Seating Co., Franz Kiel GmbH, Compin-Fainsa, FISA Srl, Kustom Seating Unlimited, Inc., Rescroft Ltd., FENIX Group LLC, FlexoFoam Pvt. Ltd., iFoam Ltd., Delimajaya Group, TransCal, Rojac Urethane Limited and USSC Group, Inc.
As per analysis, the number of local passenger trains is rising at a high rate across regions. This has offered potential growth opportunities for manufacturers of train seats to gain high profit margins. On an average, the life cover of train seats is around 6 years, post which they need to be replaced. This has given fair chance to dealers and the aftermarket to gain high traction. With increasing number of trains and growing preference for efficient cushioning, the demand for seat materials is likely to rise at a steady pace with respect to passenger trains. Moreover, prevalence of metros across major cities in developing and developed economies is predicted to fuel the demand for train seat covers. Increasing use of train seat covers in metros is largely pushing the growth of the train seat materials market in local passenger trains. The metros sub category, according to this report, is anticipated to account for a major share and use of train seat materials in metros is poised to rise at a rate higher than 5% during the assessment period.